Rosa Centifolia Cleansing Gel by REN is a natural face cleanser with protective properties made with Aloe vera and Rose. Very gentle and phosphate-free it will leave your skin refreshed, purified and soothed. Cold pressed Roses petals offer therapeutic herbal properties which are perfectly preserved. Polyphenols and tannins from Centifolia Rose petals protect against oxidative damage and tone the skin while relaxing and aromatherapy benefits of Damask Rose make you feel good. Apply enough amount in the palm of the hands of Rosa Centifolia Cleansing Gel and then emulsify. 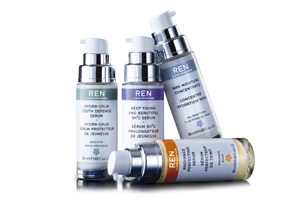 Apply the cleansing gel by REN over the face by massaging from the center of the face outwards. Massage onto face with doing circular movements and insist on wings of the nose, chin and forehead. Daily use night and day. Average rating 2/5 , based on 1 reviews. Ce produit doit très bien convenir à une peau sèches mais sur moi je n'ai pas été conquise. Il ne nettoie pas aussi bien que je l'espérais, il faut beaucoup de produit et la texture colle à la peau.